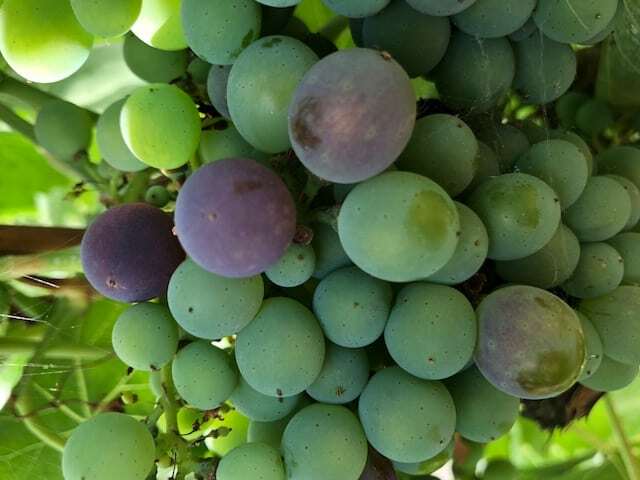 Heading into veraison Swayze Vineyard in the high desert of Los Angeles County is looking great. The fruit is ripening evenly with moderate levels of crop and a good canopy. We will be working with three varieties from this site in 2018: Grenache, Alicante Bouschet, and Tempranillo. We expect harvest to begin in the third week of August. Lewis Vineyard looks spectacular this year. We've been able to reduce water usage even further than previous years and have also been slowly planting another steep hillside block of Syrah, This new block is own-rooted and is being head-trained instead of trellised. Harvest should begin in late September and stretch into mid-October. Russak Ridge Vineyard's Grenache is looking really good. The cool weather gives this Grenache a dark intensity and structure that really stands out. The Syrah at this site will have a light crop again this season, but the quality looks really good. We've also been babying the large block of Zinfandel vines to get them ready for a small harvest this year. Grenache and Syrah will start at the end of September and we are expecting harvest dates for the Zin potentially into November. Rancho Baila Sol - Cabernet Sauvignon was first to bud out this year, but was a month behind last year and veraison is still weeks away. The Estrella clone of Syrah is on the same schedule. We made the tough decision to pull out the Sangiovese at this site and replace it with Grenache. The coolness of the site seemed to cause the Sangiovese to struggle. Ironically, Cabernet Sauvignon, which likes similarly warm conditions, absolutely thrives at this location. Estate Vineyard - Our tiny estate vineyard has been doing very well this year. We pruned the Sangiovese block to about 50% few buds this year and it set a moderate crop with a perfectly balanced canopy. Our Estrella clone Syrah has been dry farmed for the past two seasons and even without water continues to grow ferociously on the deep clay soils. Cabernet Sauvignon and Primitivo went through budburst about 10 days later than normal. The test blocks of Grenache and Mouvedre have grown in really nicely with full canopies and moderate crops. Estelle Vineyard, Santa Ynez Valley - The Sangiovese from Estelle in 2017 was exceptional and we doubled our amount this year to two tons. John Belfy and his team are rock stars and do a great job farming this site for super high quality so we've also gone ahead and added a ton of Cabernet Sauvignon to our plans.